NOTE: I apologize for the delay in posting this Episode Spotlight. I accidentally scheduled it to be published later this evening rather than at 9AM as usual and didn’t catch the mistake until right now. Capsule Summary: B.J. worries about a patient, Charles spends time with a working girl, and Klinger falls for a nurse. I was probably in middle school when I first saw this episode on FX back in the late 1990s. I wonder if I knew what a working girl was back then or if I thought Sooni was just rough around the edges. “I don’t like this dress,” she says to Charles. “With all these buttons, it take forever to get out of it.” Later, in the mess tent: “When are we gonna have a few laughs? “I’m getting bored.” Did jokes like these go over my head at 13? I honestly don’t remember how worldly I was at that age. 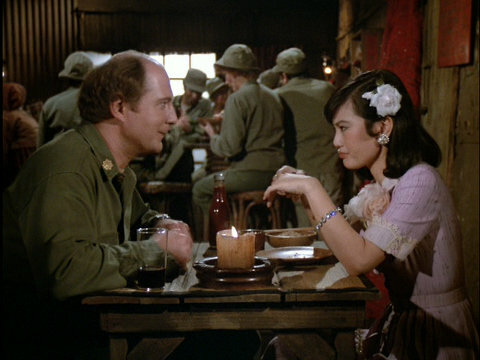 Adults watching the episode when it originally aired certainly understood the odd relationship between Charles and Sooni. Most probably made the connection to Pygmalion or My Fair Lady as well, with Charles in the Henry Higgons role and Sooni as Eliza Doolittle. Of course, things don’t work out for Charles, whose attempts to enrich Sooni and turn her into a high-class broad just don’t work. I have no trouble believing that Charles gets lonely. I have a hard time believing he could ever be lonely enough to approach Sooni. In the B story, poor Klinger falls in love with Debbie Clark, a nurse from the 8063rd. He’s thinking forever but she’s only interested in right now. Klinger doesn’t want a fling and the two part ways. It’s unclear how much time passes during the episode but it feels like only a few days rather than weeks. That’s not a lot of time to fall for someone. Finally, there’s the C story. It’s a weak one. B.J. and Hawkeye annoy one another to such an extent that Hawkeye moves out of the Swamp. Hawkeye claims B.J. is obsessing about a patient; B.J. says Hawkeye is obsessive about everything from brushing his teeth to sniffing his food. B.J. also thinks Hawkeye is too competitive. Margaret, Father Mulcahy, and Colonel Potter have very small roles. Colonel Potter is in two brief scenes while Margaret and Father Mulcahy only appear in the bingo scene. Charles tries to enjoy poetry with Sooni. This was the first of five episodes directed by Mike Farrell. Radar does not appear in this episode. He’s away on R and R. His absence allows Hawkeye to move into company clerk’s office to get away from B.J. I wasn’t very worldy at that age either, and in fact, that’s why Radar was always my favorite character: the naive kid that he was that others would tease about his lack of knowledge of the facts of life and such? I was that kid in middle school, that’s why I related to Radar so much when I started watching the show. Aside from that, I think this episode was fairly average. Sooni doesn’t make any sense to me, even as an adult though: if she’s of one of Korea’s oldest and most aristocratic families, why would she have to resort to being a B-girl? Or was the background something Charles cooked up in his mind to try and justify his attraction to her? Charles wasn’t exactly a saint himself, but I doubt he would set aside his own aristocratic upbringing to attempt to romance a working girl, and likewise, I doubt an aristocrat would have to prostitute herself to make a few bucks. I think this episode was also the turning point in Hawkeye and B.J.’s relationship (moreso than their fight in “Preventative Medicine”): it seems like from this point on, their fighting and bickering became increasingly more commonplace. I also feel a little sorry for Klinger. He finally found some happiness for the first time in a long time while in Korea, but it turned out to be short-lived. Kind of cruel, but then again, that was clearly the underlying theme of the episode: love can be cruel. No that was definitely something Charles cooked up to make her seem better than she was. He’s such a proud man that even he probably didn’t understand why he was messing with her. The fact that she approached him and said the right things about long nights and being lonely was enough to make him try to make something more of her than she was. The bickering between BJ and Hawk apparently mirrored the bickering that went on between Farrell and others on the show. There’s a reason why Mike Farrell didn’t become a close friend of Alda after the show but Wayne Rogers did. I suspect based on interviews I’ve read and seen with him that he’s not the easiest person to deal with all the time. He got difficult when he disagreed with something in the script and wouldn’t let up until it was changed regardless of it really happened to doctors in Korea. An entertaining episode, and one I’d watch on occasion. My favorite part was the ending when Klinger and Charles drunkenly sung “Stormy Weather”. I thought Hawkeye sniffing his food reminded me of my mother’s relatives years ago. The reason being, back then they didn’t know if their food was fresh. Can you blame Charles for going off on his tent-mates knowing what they’d gone through?